One of the reasons I chose the DAC1 primarily as a headphone amp, is that the headphone jacks on it are driven by Benchmark Media's HPA-2 headphone amplifier. Benchmark states the amp can achieve "less than 0.0003% distortion under load" (the company sells the HPA-2 for $150 separately.) I only found one other DAC on the market which used a dedicated, internal headphone amp, if there was even a headphone jack at all. Grace had an equally impressive unit which I was seriously considering but ultimately decided against due to it's price (over $1500). The DAC1 delivers it's full output to TWO pairs of 60-ohm headphones; how many stand-alone headphone amps can claim that? I was also attracted to the unit's ZERO Ohm output impedance. I've done a bit of research into output impedance; more & more companies are realizing the closer to zero you are in output impedance the closer you're going to get to perfect sound. I may start a firestorm of controversy with that statement (tube amps almost never run low output impedance), but after reading Bob C's and others opinions on this subject and listening for myself, I "drank the kool-aid." Interestingly, the DAC1 shines as a preamplifier. In fact, if you are a minimalist and want the absolute shortest signal path, go directly from the DAC1 to your power amp & discover a new level of clarity in your system. 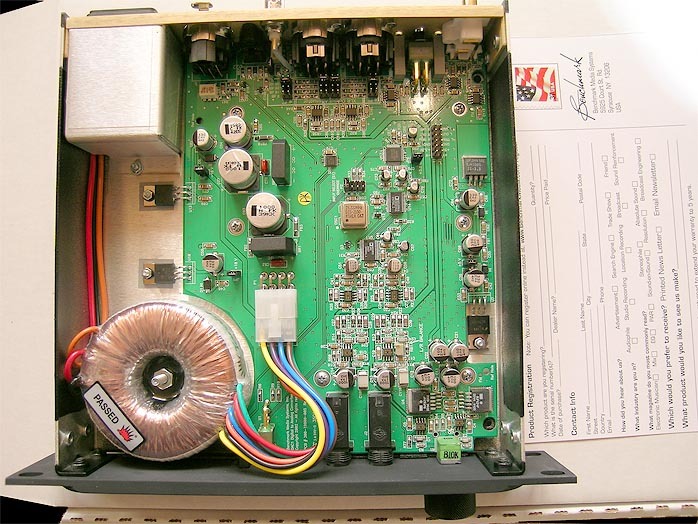 The DAC-1 manual is incredibly detailed, not surprising since the unit is aimed at the professional audio crowd, and the extent of technical detail it goes into is almost mind-boggling. A "quick start" section would be a welcome addition for your average audiophile/layman. I've got to say, if you've never heard a stellar set of cans on an uncompromising amp, you're in for a real eye-opener. I cannot overemphasize the clarity, sound stage, and Wow! factor of this combo...it's simply STUNNING. The most noticeable improvement is in the upper registers, but if you listen really carefully, you'll note that EVERYTHING is utterly clear and un-muddied (I'd never noticed it before, but with this reference it was obvious). At first, it seems as though there is something missing in the lower frequencies, but after more extensive listening, I realized everything was there, although presented in a much more articulate fashion. Some will call this "cold" or "analytical", but if I've discovered nothing else about my critical ear, I prefer "truth in reproduction" more than a romantic notion of "tube-like" sound. Wow, now I've REALLY stirred up a hornet's nest! Well-recorded piano music (a difficult feat) sounds phenomenal through the DAC1. I auditioned Bobby McFerrin's "Turtle Shoes", The Monty Alexander Trio's "Impressions in Blue" CD, Diana Krall's "Love Scenes" CD, and Norah Jones "Not Too Late" CD...immaculate on all counts. I also auditioned one of weitrhino's favorites, the CD "Grotesk" from the French band Morglbl (pronounced "MOR-GLE-BUL"). One of my favorie tracks is "Lieutenant columbin". I continue to find details that were simply not aurally "visible" before. Overall, I'm extremely pleased with the DAC1. The only criticisms I can come up with is the lack of a remote option or analog inputs (for headphone amp use with a non-digital source). I highly recommend it for those of you who want a (relatively) cheap upgrade for your CD transport with the added benefit of a kick-@$$ headphone amp. Last edited by TNRabbit on Wed Jan 09, 2008 8:19 am, edited 2 times in total. Last edited by BlueMDPicker on Tue Jan 08, 2008 11:46 am, edited 1 time in total. "Here in the equipment reviews threads, I would like to keep this as clean as possible and not turn this into a bunch of discussion threads. What I would like to see happen is each piece of equipment only receiving one new thread and please do not ask questions about the equipment only post your reviews. If you'd like to ask questions about this piece of equipment please post a new thread in a different category. I do not want to see the reviews thread turned into a discussion thread please keep it as a neat and clean as possible. If any thread becomes a discussion thread, I'll split the thread and remove all inappropriate discussion questions and answers to a separate thread in the forum."